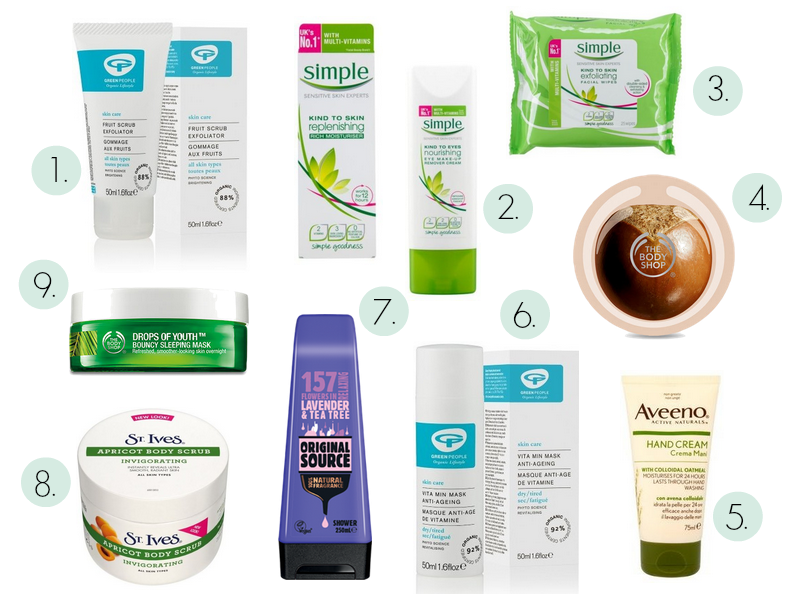 I realised the other day that I’ve never, ever written about make-up and beauty on here, which is nuts because I LOVE trying out bath and body products – since I started thinking more ethically, I’ve been looking around for more eco-friendly skincare, so I thought I’d share my current favourites. I’m starting today with face and body products; from low budget moisturisers to higher-priced masks that promise fountain-of-youth style effects. The lovely folks at Green People sent me a little gift bag a while ago,which included their exfoliating fruit scrub, and I’ve been using it ever since – I’m really picky about what I put on my face, because I’ve got really really sensitive skin, and anything that doesn’t agree with it leaves me red, blotchy and spotty. This leaves my face feeling fresh and clean, but without that ‘tight’ feeling that lots of scrubs leave behnd. I’d been wanting to try Green People makeup and skincare for ages, and it was just as gentle and lovely as I’d expected; there’s no chemical nasties such as parabens or lanolin, and they’re also not bad for the environment. Hurrah! I’ve been using the Simple range since I was in my early twenties and I just love it – the moisturiser leaves my skin feeling really soft and dries in really quickly, which is perfect for me as I hate anything that leaves a sticky residue. I only really use the eye makeup remover when I’ve had waterproof makeup on, but it’s super gentle on eyes and doesn’t burn or sting – I love the facial wipes for cleansing, but I think I’m going to buy a proper cleanser as wipes are really bad for the environment! I spoke a while ago about the handcream I was using, but when it ran out and I forgot to order some more, I discovered the Aveeno range in Waitrose. It’s not organic, but it’s the only high-street brand I’ve ever used that doesn’t burn when it touches my poor, cracked, garden-ravaged hands. The second item in the Green People gift bag was the MOST amazing face mask I’ve ever slapped on my skin. I’ve tried hundreds of them before, and they all either make my skin itch or burn, or leave it really red afterwards – but this one couldn’t be more gentle. It’s packed full of plants, and every time I use it, my skin looks plumper and more ‘even’, and feels sooooo soft afterwards – it’s aimed at tired, dry skin, and I’ve certainly got that! I’ve been using this for absolutely ages – it’s Vegan certified and smells gorgeous, and it’s cheap as chips. Happy days! Another product I’ve been using since my early twenties, the St. Ives body scrub is by far the best one out there (well, I think so anyway!) It’s really thick, and is packed full of exfoliators, where as others I’ve used have been a bit weak and watery – it’s one of my key ingredients in the battle against my problem knees! I first tried this overnight mask when the nice lady in The Body Shop gave me a sample after I bought some other things – at first I was sceptical; a facemask you put on and leave on at night? I had images in my head of crusty, product-soaked pillow and an itchy face, but actually I was pleasantly surprised. Although it doesn’t sink in completely at first, it’s dry by morning and really did leave my face feeling ‘bouncy’ – the wrinkles around my eyes always look a little bit less like caverns after I’ve used it. Can’t be bad! I’ve been searching FOREVER for a good pore minimiser, so if anyone knows of a good one, do let me know in the comments! Thanks!